With the number of restaurants rising year on year, it’s becoming more and more important to come up with fun and creating restaurant promotion ideas. We’ve gathered our top restaurant marketing ideas to help you stay ahead of the game, boost sales and improve customer loyalty. One of our favourite ways to market a restaurant is through social media. This rising marketing platform allows you to reach billions of people. And the best bit about it? It’s completely free! For restaurants, we recommend image-based social media such as Instagram. The key with this is to keep images looking professional. This image of a pizza from Cecconi’s is taken in a bright setting and the food looks polished and delicious. To keep your images professional, you can invest in a good camera, but many modern smartphones have excellent cameras that work just as well. Find a bright spot in your restaurant (that isn’t directly in the sun) and take images during the day for best results. The more engaging your online content, the more successful this restaurant advertising via social media will be. Hosting a giveaway is another fantastic method of exciting customers using this platform. And there’s nothing more engaging than giving away freebies! If you’re marketing for a small, local restaurant, the best giveaways are discount vouchers or coupons for a free meal, drinks etc. You can either directly message the winner with their voucher code, or deliver it printed on a business card or postcard for a special finishing touch. Our favourite example of this is Starbucks’ White Cup Contest in 2014. They encouraged customers to post their doodles on their mostly white coffee cups, and the winner would have their design printed on a limited-edition version. They used the hashtag #WhiteCupContest and generated nearly 4,000 entries in three weeks. Larger restaurants with more recognisable branding and a growing fanbase can benefit from marketing with promotional merch. Custom T-shirt printing, personalised mugs and fun tote bags with your logo on are all great options. Another way of using social media to market your business is to repost customer artwork. Just like your own pictures, make sure to pick ones that are high quality and make your food look amazing. Not only does this show that other people love your food, it’s also a great incentive for others to share their pics too – they’ll also want to be featured on your channel! An example of a restaurant that uses this marketing idea is Vietnamese street food restaurant, Pho. Here’s their Instagram featuring loads of user-generated content to help inspire you. Remember to tag your customers in the post when you repost it to your account! A solid email restaurant marketing can be a fantastic way of boosting sales and attracting customers to grab a bite to eat with you. You already know that the people who have signed up to receive your marketing emails love your food – why else would they sign up? So, you know you’re targeting the perfect target audience. Use your marketing emails to send personalised promotions, updates to your menu and other fun content your recipients will love. For example, you could send recipes to recreate some of your dishes, newsletters and use it as another way of promoting your giveaways. One of the key marketing tools for restaurants is reward cards and loyalty programmes. Loyal customers are central to any business’s success, but this is especially true for small restaurants. Find out more about our top customer retention strategies here. Food bloggers are big news – when your customers search online for your restaurant, they’re likely to come across these kinds of reviews. They’re generally seen as more trustworthy than traditional marketing that comes directly from your business, so customers are likely to take their word. It’s the digital version of word of mouth! Perform an online search for food bloggers that are local to you and get in touch. You could offer them a free meal in return for a good review. Alternatively, you could hold a VIP event specifically for bloggers and promote this on social media and website asking people to sign up. Larger restaurants that are growing a fanbase would heavily benefit from a mobile app. It’s a great option for customers to browse your menu, book a table and keep up to date with your latest news all in one place. 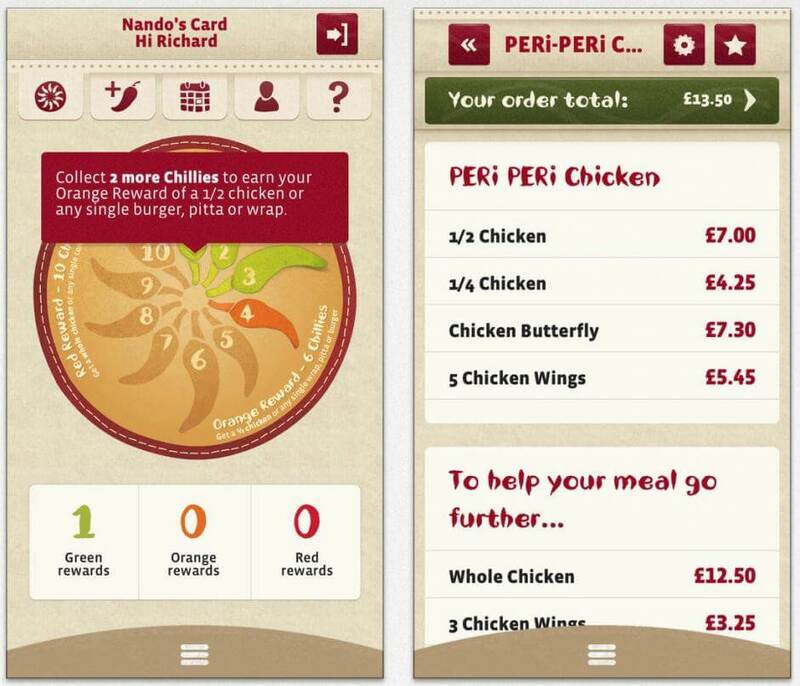 One of our favourite restaurant apps is Nando’s. They count reward points in ‘chilli’ and allow you to track this as well as find your nearest restaurant and book a table. Paying for an app to be built is not always a financially viable option for smaller restaurant business. What you can do, however, is partner with online takeaway ordering services like Just Eat, Deliveroo and Uber Eats to give customers the option of ordering through an app. Another way of boosting sales for your restaurant is to start offering a delivery service. This makes it more convenient, which is something modern consumers value highly. There are pros and cons to using other people’s apps, like Just eat – they’ll get a certain percentage of the sale. 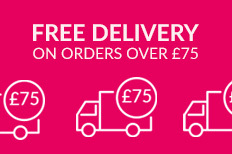 So, if you’d rather have more control over this service, we recommend doing it in-house and having a dedicated member of staff to take over delivery. Looking for something a little more budget-friendly? You could also offer a takeaway service rather than delivery. Let customers come in and pick their food up – it won’t cost you anything to start running this added service, but it could help you stand out from local competitors. Creating a delicious menu design for your hospitality business is crucial for showing your customers what you’ve got to offer. A strategic layout can even make customers spend more than they intended to (loaded fries vs regular isn’t even a choice, is it?). Using hungry colours (like red, orange, yellow and certain shades of brown), bordering off special menu items and using clean, easy-to-read fonts are all easy ways of boosting your menu’s appeal. Check out our top tips for designing a menu here. Design not your strong suit? 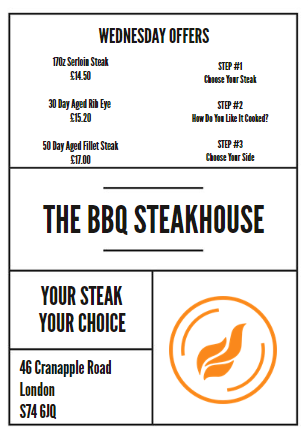 We’ve got loads of free menu design templates you can customise. Here’s one of our most popular options – just click on the image to start designing now! Google my Business is a free online tool to help businesses manage how their information appears when people search for them on Google, including Google Maps. As well as helping your restaurant business look more reputable, you can give customers access to opening hours, website and street address to make it even easier to find you too! You set up an account here with Google and can either manage your account online or through the app. Keeping your restaurant ahead of the market comes down to the restaurant owner’s ability to spot a trend and adapt to it. So, what’s the biggest restaurant marketing trend for 2019? We’re betting on Kraft. Kraft paper is a trend we don’t see going away anytime soon. This brown, rustic paper gives a crafty, homemade feel with a professional finish. It’s an ideal choice for restaurants, and works for a range of different print essentials like business cards and flyers. Another huge customer concern at the minute is the environment. If your brand resonates with this and promotes itself as eco-friendly, menu and business card printing doesn’t have to be your downfall. 100% recycled stock is just as thick and high quality as standard, but it’s uncoated – meaning you can recycle them once you’ve finished with them! Blogging isn’t just for the critics you know! A great way of boosting your business’s online presence and SEO (search engine optimisation) is to create a blog that positions you as the expert in the field. Use this platform to share news, recipes, competitions and funny stories. You don’t have to post constantly to be successful – just when you have some news that you want to share. We recommend once a week, or every couple of weeks. One of our favourite restaurant blogs is Pizza Express’s News Blog. Here they host all of their menu changes, competitions and general news. They post on average twice a month and every piece of content is relevant to their target audience. There are certain times of the year when people always eat out – Mother’s and Father’s Day, Christmas and Valentine’s Day to name a few. Although your restaurant will naturally see a push in sales around these times, marketing special menus and offers that coincide with these holidays will give you an added boost. Create a marketing calendar to plan out your big promotions for the year. That way, you’ll be able to order your print on time and you’ll always be prepared. The marketing idea behind happy hour is that you’re encouraging customers to come into your restaurant during times that would otherwise be quiet. You could offer a discounted set menu, 2-for-1 drinks or even exclusive menus items. A DL size menu is the perfect size and shape for your happy hour specials. It’s thin and long, making it great for lists. You can even choose to print single or double sided depending on how many options you want to offer! What events are happening in your local area that your restaurant could take advantage of? Marathons, charity events and festivals can mean increased footfall for your business, especially if you get your marketing right. Create an A-frame to attract passers-by into your restaurant and theme the offer on the event. For example, if it’s a summer event or marathon, offer a free drink to marathon runners. This type of marketing can work for more long-term trends too. When Pokémon Go first became popular, many businesses took advantage of this by offering deals to players advertising this via posters in the window. Where there’s increased traffic, there’s a marketing idea! Every time you launch a new menu, new location or other venture, make sure to shout about it! You could send leaflets out promoting the change to local customers, or send an email newsletter round. A creative example of a store launch is Chipotle’s early strategy. They’d target a university-age market and would attend events, like music gigs, and launch printed T-shirts out into the crowd. These T-shirts actually acted as a coupon for a free burrito when the new store opened! People love the idea of attending special events. And taster events are a great way to get customers in and making food purchases during times where business might be slow. For example, you could offer a wine or beer tasting evening where customers pay for a set menu that’s accompanied by special drinks that are designed to complement the food. 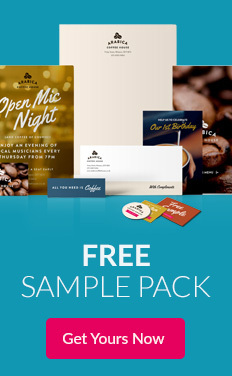 Live entertainment, such as music, stand-up comedy and open-mic nights are another fantastic marketing idea for restaurants, bars and cafés. If you advertise these special events, you could attract people who otherwise might not have come. And you never know, they might come back even after the mic’s been turned off! Choose your entertainment to match the style of your businesses. A classic pianist would make a great high-end restaurant entertainer, but wouldn’t necessarily go down as well in a cocktail bar. Always keep your clientele in mind when organising live entertainment. The key to your restaurant marketing? Planning ahead. Make sure you’re completely up to date with the latest marketing trends by checking out our free 2019 cheat sheets. Here, you’ll find the latest strategies for promoting your restaurant or café that work.